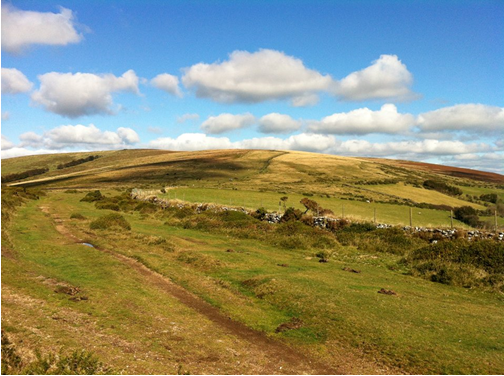 A chance to see Dartmoor in early autumn, there will be three routes all with a full route description; they are on a mixture of footpaths, lanes and open moorland around Chagford. The Challenge is to complete your chosen distance: 30 miles, 21 miles or 17 miles, by 19:00. The event will start and finish at the Jubilee Hall Chagford SX 701875 located in the centre of Chagford near the church, registration will start at 7:15 to 08:50. Strictly no runners starting before 09.00, as the checkpoints will not be open for you. No dogs allowed. This has been agreed with the landowners, so please respect this. Car parking is available at Chagford Primary School (pending permission) on the way into town. Please use it unless otherwise directed. Please note that car parking is likely to be limited, if possible, please car share from Moretonhampstead, where there is more free car parking. There are toilets and simple washing facilities at the Hall. There will be 5-4-3 checkpoints depending on your chosen distance, with simple food and cold drinks available. A pasty & drinks will be available at the finish, all included in the entry fee. If you have done this event before, please note that the food will be reduced from previous years, as this is the first time that this team has organised the event, hence we are trying to keep it simple. If you feel that this may be a problem, then you may wish to supplement by bringing a little food of your own. Please bring a mug for drinks at the checkpoints, as there will be no cups available at the checkpoints, we are trying to reduce the volume of plastic used. Entrants must be able to read a map and follow compass bearings, especially in the event of bad weather, All routes are covered by the OS Explorer OL28 Dartmoor (1:25000) alternatively the OS 1:5000 Landranger Map No 191 covers the 21 & 17 mile routes with the addition of No 202 for the 30 mile route. Because the routes have been agreed with the Dartmoor National Park Authority it is important that you keep to them at all times. Certificates will be given on the day to all those who complete the walk. There are some FAQ’s on the facebook page which you might find useful.